Red Zone, Cevin Fisher, Rhemi & Lynn Lockamy, Rhemi, Cassius Henry, Boe & Zak, Phase II and more. 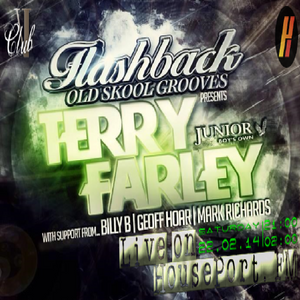 Flashback are back to kick of 2014 with House legend Terry Farley. Co- founder of the legendary junior boys own record label, terry has had numerous hits over the years as a solo artist and co-produced hits as Farley and heller such as the massive ultra flava, and also under the alias fire island who had massive hits such as...there but for the grace of god and if you should need a friend...the list goes on and on!!!!! Backed up by our very own Billy B, Geoff Hoar, Mark Richards this promises to be another top night of oldskool house house and garage at its very best BABY!!! !